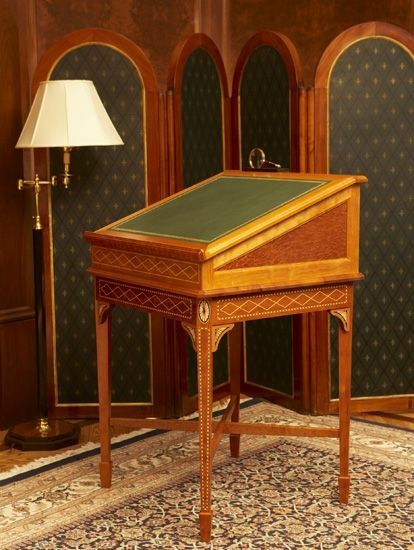 This distinguished reading desk inspired by traditional style was custom tailored to the client's specifications. Exotic wood, veneer, inlays and a custom leather top hand tooled with gold combine to create a signature piece. 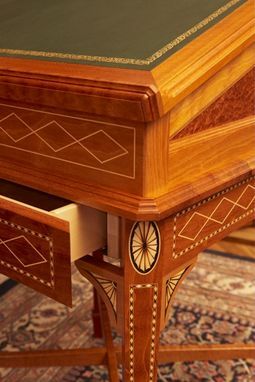 It was meticulously crafted by hand selecting and combining exotically figured South American Mahogany, intense redwood burl recessed panels and detailed inlays. 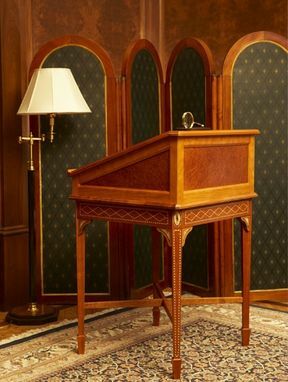 A hand rubbed clear finish was applied to showcase and intensify the beautiful combination. It has been said, "details, details, details". 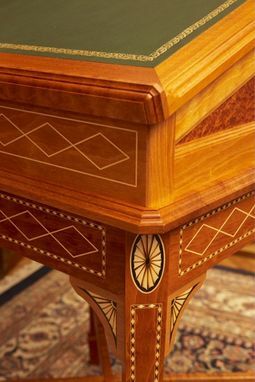 Intricate custom details include; an inlayed leather top custom dyed and hand tooled with a gold boarder, fan and oval inlays, banding inlays on the splayed legs, maple inlay diamond pattern on the aprons, and finishing touch, a concealed maple dovetailed drawer. Dimensions: 36" x 30" x 42"